Renal Transplantation; Pediatrics; Living Donors; Oman. A kidney transplantation program started in Oman in 1988 as a joint venture between Sultan Qaboos University and the Ministry of Health (MoH). It included both pediatric and adult patients. Before 1988, donors and recipients were sent to Oxford University in the United Kingdom for kidney transplantation as part of an agreement between the MoH and Oxford University. In 1993, Omani transplantation legislation was established, according to which only living related donors (LRD) (by blood or marriage) were permitted. This law also allowed deceased donor transplantation and outlined the criteria for brain death in the country.13 Omani legislation prohibits commercial transplantation. The first pediatric kidney transplantation to an Omani child was performed later that year. Our center is the only center to follow pediatric renal transplant patients in the country, with an active pediatric transplant program. Since 1970, Oman has greatly improved its health care system and is considered one of the leading countries in this field. However, medical tourism, including commercial transplantation, continues14 despite active measures to prevent and to promote local organ donation and the establishment of a Kidney Donation Clinic. This study aims to report 22 years experience in pediatric kidney transplantation in Oman. We included patients who received donation from a LRD or (commercial) donation from a living unrelated donor (LURD). There are limited studies about pediatric renal transplant outcome in the region. Our study sheds necessary light on long-term graft survival in populations with a high rate of consanguinity and many inherited genetic and metabolic etiologies for ESRD. We conducted a retrospective study of all Omani children below 13 years of age who received a kidney transplant from January 1994 to December 2015. These patients received kidney transplant either in Oman or abroad then continued their follow-up at our center. Our center is the only center providing pediatric renal transplant service in the country, which has an estimated population of 4.5 million. Since 2009, all pediatric LRD kidney transplantations were performed at our center. Before 2009, most ESRD patients who required kidney transplantation were sent abroad with their potential donors a part of an official cooperative program and only a few patients had kidney transplantation locally. Initially, a visiting transplant surgeon performed the surgery. Later, a local surgical team was created. Currently, patients that require dual liver-kidney transplant are still being sent abroad as a liver transplant program is still in the process of establishment. The immunosuppressive protocol consists of induction with intravenous methylprednisolone administered intraoperatively and a second dose after 24 hours, and two doses of basiliximab at day zero and day four. Maintenance immunosuppressant protocol includes tacrolimus, mycophenolate mofetil, and oral prednisolone according to tapering protocol. Prophylaxis with cotrimoxazole and nystatin are given for all patients for the first three months. Prophylaxis with oral valganciclovir is given for three months to high-risk recipients (i.e., seronegative recipient and seropositive donor). Some patients with ESRD were taken by their parents abroad (despite extensive counseling) to receive commercial kidney transplantation. The majority of such patients returned a few days after the transplantation with no documentation regarding the donor, pre-transplant investigation (such as human leukocyte antigen (HLA) matching or viral serology of donor), transplant surgery, or hospital course. There was no communication between the commercial transplantation centers and our program. Patients were divided into two groups; LRD and LURD. One patient received a kidney from a deceased donor and was included in the LRD group. Data were collected from patients’ electronic charts (Al Shifa system), a secure computer program which is used in our center to document patient history, examination, investigation, and treatment received during all hospital visits including emergency room visit, outpatient’s clinic visit, and inpatient admissions. Data collected included patient demographics, ESRD etiology, modality and duration of dialysis, donor type, complication of kidney transplantation (including surgical complications, documented infections, graft rejection), graft and patient survival, and duration of follow-up. The study was approved by the Royal Hospital Ethical Committee. Information about graft survival at one, three, and five years were obtained. 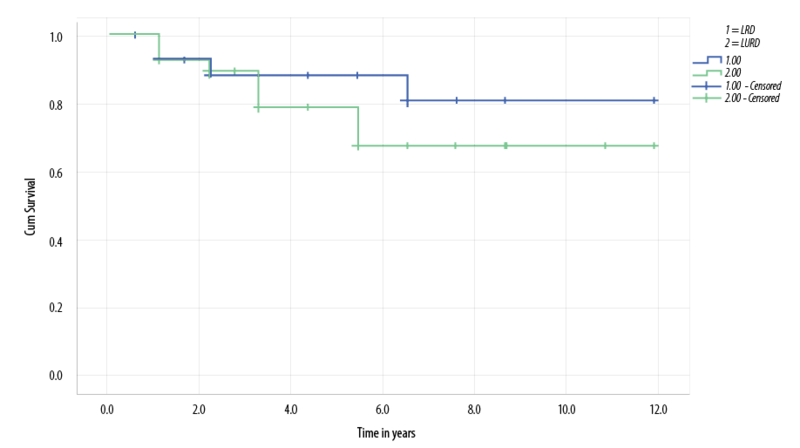 Estimated glumerular filtration rate (GFR) was calculated at one, three, and five years using the Schwartz equation.15 Patient survival at five years was calculated for both groups. Hypertension was defined according to the fourth report on diagnosis, evaluation, and treatment of high blood pressure in children and adolescents (2004).16 The initial agent for management of hypertension in our patients was amlodipine; other agents such beta blockers were added if blood pressure was not well controlled. Delayed graft function was defined as the need for dialysis in the first week post-transplant and improvement of graft function with time. Primary non-function was defined as the requirement for dialysis in the first week post-transplant without further improvement of graft function. Early nephrectomy was defined as the need for graft nephrectomy in first six months post-transplant. Graft failure was defined as a return to dialysis, need for second kidney transplantation, or death with a functioning graft. Rejection was diagnosed by allograft biopsy when patients presented with acute deterioration of allograft function. Histopathology findings were graded according to Banff classification.17 Protocol biopsies are not practiced in our center. Patient data were collected in SPSS Statistics (IBM SPSS Statistics for Windows. IBM Corp. Released 2011. Version 20.0. Armonk, New York, USA). Comparisons between groups were made by t-test or chi-square test, as appropriate. The level of statistical significance was set at p < 0.050. 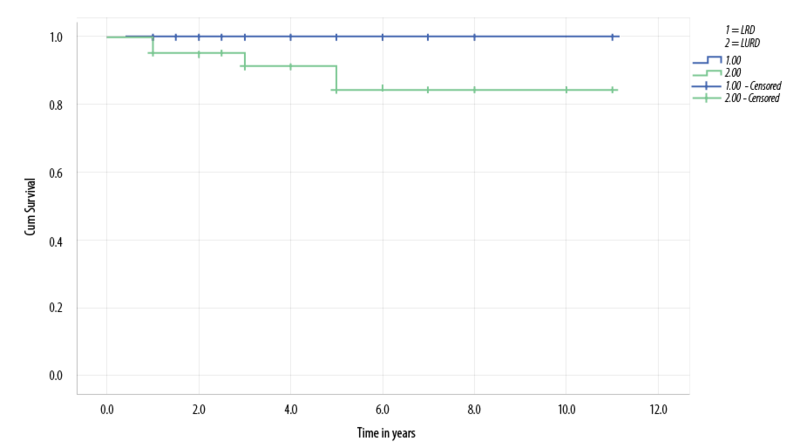 Kaplan Meir survival curve was used to compare the graft and patient survival between the study groups. Over 22 years our center followed 70 primary renal transplant recipients. Thirty-nine patients (55.7%) were male. The median age at transplantation was nine years. Twenty-seven patients (38.5%) received LRD transplants, 64.2% of these were performed locally. Countries in which LRD was performed for Omani children were the United Kingdom (n = 3), India (n = 5) and Saudi Arabia (n = 1) [Table 1]. Almost half the LRDs were mothers (48.0%), followed by fathers (19.0%), aunts (15.0%), uncles (11.0%), and adult siblings (7.0%). Three children received a dual liver and kidney transplant from a living relative (two siblings with primary hyperoxaluria type 1 and one patient with autosomal recessive polycystic kidney disease). One patient received a deceased donor transplantation performed locally in 1994. The recipient was 17 months old with Denys-Drash syndrome, and the kidney was retrieved from a preterm baby with brain death. The patient had good graft function for 20 years after which he developed chronic allograft nephropathy and has required hemodialysis since 2016. *including one patient that received a renal transplant from a deceased donor. LRD: living related donor; LURD: living unrelated donor; ESRD: end-stage renal disease; CAKUT: congenital anomalies of kidney and urinary tract; NS: nephrotic syndrome; GN: glomerulonephritis; PKD: polycystic kidney disease; HLA: human leukocyte antigen; IL2-R B: interleukin receptor blocker; ATG: anti-thymocyte globulin; CPAZ: cyclosporine, prednisolone and azathioprine; CPM: cyclosporine, prednisolone and mycophenolate; TPM: tacrolimus, prednisolone and mycophenolate. Forty-two patients (60.0%) received LURD transplants in various countries: Pakistan (n = 34), China (n = 5), Iran (n = 2) and India (n = 1). The most common primary diagnosis for patients who received kidney transplantation were congenital anomalies of the kidney and urinary tract (CAKUT) in 32.8% of patients followed by familial nephrotic syndrome (20.0%), and polycystic kidney disease (18.5%). Fifty percent of patients were on hemodialysis before transplantation, 35.7% were on peritoneal dialysis, and 14.2% received preemptive renal transplantation [Table 1]. HLA A, B, DR alleles were available for 82.1% (n = 23) of LRD patients, 73.9% (n = 17) had three matches (haplotype), 13.0% (n = 3) had four matches, 8.6% (n = 2) had six matches, and 4.3% (n = 1) had one match. HLA were available for only 38.0% (n = 16) of the LURD transplant patients, 87.5% (n = 14) had three matches, one patient had four, and the other had two matches. Sixty-four percent of our LRD transplantation patients received IL2-R blocker as induction agents compared to only 26.1% of LURD transplant patients. Triple therapy with prednisolone, tacrolimus, and mycophenolate is the initial therapy for 75.0% of our LRD transplantation compared to 57.1% of LURD transplant patients who were on cyclosporine along with prednisolone and mycophenolate as initial therapy. Most LURD transplant who were initially on cyclosporine or azathioprine were changed to tacrolimus and/or mycophenolate immediately after arrival at our center. Tacrolimus blood level was maintained at 4–6 mcg/L beyond six months of transplantation for all patients with the aim of keeping tacrolimus levels in the lower target range in LRD patients. Most LRD transplant patients were able to taper prednisolone to 2.5–5 mg on alternate days, but no patients from the LURD group were able to do this [Table 1]. Children who received LURD kidney transplant had high surgical complications at 42.8% compared to 17.8% for LRD recipients (p-value = 0.005). Five patients from the LURD group had early graft nephrectomy; two had hyperacute rejection and two developed invasive fungal infections. One patient lost her graft due to severe bleeding secondary to rupture of graft arterial anastomosis during balloon angioplasty for severe renal artery stenosis (RAS). In contrast, no patient had early nephrectomy from the LRD group. Four patients from LURD group developed non-graft function or delayed graft function [Table 2]. Table 2: Kidney transplant complications. LRD: living related donor; LURD: living unrelated donor; RAS: renal artery stenosis; UTI: urinary tract infection; CMV: cytomegalovirus; EBV: Epstein-Barr virus; BKV: BK virus. Three patients from LURD group developed invasive fungal infection [Table 2]. Two developed persistent fever, graft dysfunction, and rapidly progressed to graft infarction. Graft biopsies of the first patient showed invasive aspergillosis and for the second showed mucormycosis. The third child presented with aspergillosis wound infection, which was treated by wound exploration, debridement, and antifungal medication. Viral infections were seen in 57.1% of LRD patients and 45.2% of LURD patients. The rate of hypertension was higher in the LURD group at 73.8% compared to 53.5% in the LRD group. Acute rejection developed in 21.4% in the LURD and 17.8% in the LRD group [Table 2]. Four patients from LURD group died during the first five years post-transplantation. Two patients died with sepsis, one after treatment for acute rejection, and the second during treatment for post-transplant lymphoproliferative disorder. The other two patients died after transplant graft failure secondary to chronic allograft nephropathy. No patients from the LRD group died during the follow-up period. Five-year patient survival for patients who received LRD transplant and patients who received LURD transplant were 100% and 84.0%, respectively [Figure 1]. graft, one six months after transplant due to recurrence of primary hyperoxaluria, the second lost her graft two years post-transplant secondary to acute rejection. One child lost her graft because of polyoma (BK) nephropathy and the other secondary to chronic allograft nephropathy. Graft survival at one, three, and five years for patients in the LRD group were 96.0%, 90.0%, and 78.0%, respectively [Figure 2]. Figure 1: Kaplan-Meier survival curve demonstrates lower living unrelated donor (LURD) patient survival compared with living related donor (LRD) patients, but this was not statistically significant (p-value = 0.138). Figure 2: Kaplan-Meier survival curve demonstrates lower living unrelated donor (LURD) graft survival compared with living related donor (LRD) patients, but this was not statistically significant (p-value = 0.797). This 22-year retrospective review of a single center included 70 patients who received kidney transplantation and showed comparable outcomes to recently published data. Half the patients in our cohort were on hemodialysis before transplantation, one-third was on peritoneal dialysis, and the remaining received preemptive kidney transplantation. The high proportion of patients who were on hemodialysis is explained by the fact that hemodialysis was the main dialysis modality practiced in our center in the past. Few patients were on continuous ambulatory peritoneal dialysis. The automated peritoneal dialysis (APD) program was established later. Currently, most children who have ESRD at our center are on APD, and only a few are on hemodialysis. The number of patients who received commercial kidney transplantation abroad is higher than those who received LRD transplantation. This was due to the unavailability of an active LRD kidney transplantation program for children locally before 2009. In addition, there were no suitable donors available for many patients due to ABO incompatibility or because parents had other comorbid conditions such as hypertension, diabetes, or obesity. In our study, viral infections were documented in 57.1% of LRD patients, higher compared to the LURD group. However, cytomegalovirus (CMV) and hepatitis C were more common in the LURD group. This could partly be explained by increased surveillance for viral infections in LRD patients and under-reporting of other mild viral infection such as warts and herpes gingiva-stomatitis infection in the LURD group. p = 0.005), significantly higher mean serum creatinine at six months and one year and a higher rate of CMV and hepatitis C infection. However, there was no significant difference in graft and patient survival at one or two years after transplantation.26 In another study from Korea, 87 adult patients who received kidney transplantation abroad were compared to patients who had transplants locally. Patients who had transplants abroad had a significantly higher rate of biopsy-proven acute rejection, infections, and hospitalizations. Patient survival rate, however, was similar in both groups. These findings persisted even after matching the patients who received overseas transplantation to a similar number of patients who had transplantation locally.27 Our study confirmed the findings of the above studies regarding potential risks of commercial kidney transplantation. Commercial kidney transplantation has its ethical issues and predisposes patients to major complications. People should be educated about the medical and surgical risks of such surgery and the benefits of LRD kidney transplantation to discourage commercial kidney transplantation. Efforts should be directed to increase the awareness of the ethical issues and potential risks to the donors and recipients of commercial kidneys. In countries where there is commercial kidney transplantation, policies should be implemented to prohibit it. We fully support the international efforts to ban such transplantation. In Oman, establishing programs to increase organ supply like cadaveric transplantation program, paired exchange, desensitization, and ABO-incompatible transplantation will increase the domestic supply of organs and prevent people from seeking commercial transplantation. Our pediatric kidney transplant program, although a young program, has had successful patient outcomes comparable to international programs. However, many of our patients obtained commercial kidney transplantation abroad despite the efforts to discourage such transplantation. These patients had higher morbidity rates and worse outcomes. Efforts should be undertaken to educate people about the ethical and medical issues of commercial kidney transplantation, and legislation should be put in place to prohibit it. Establishing transplantation programs that increase the supply of organs is essential to discourage people from obtaining kidney transplantation abroad. 1. Fine RN. Growth following solid-organ transplantation. Pediatr Transplant 2002 Feb;6(1):47-52. 2. Fennell EB, Fennell RS, Mings E, Morris MK. The effects of various modes of therapy for end stage renal disease on cognitive performance in a pediatric population–a preliminary report. Int J Pediatr Nephrol 1986 Apr-Jun;7(2):107-112. 3. McDonald SP, Craig JC; Australian and New Zealand Paediatric Nephrology Association. Long-term survival of children with end-stage renal disease. N Engl J Med 2004 Jun;350(26):2654-2662. 4. Gritsch HA, Veale JL, Leichtman AB, Guidinger MK, Magee JC, McDonald RA, et al. Should pediatric patients wait for HLA-DR-matched renal transplants? Am J Transplant 2008 Oct;8(10):2056-2061. 5. Moudgil A, Dharnidharka VR, Lamb KE, Meier-Kriesche HU. Best allograft survival from share-35 kidney donors occurs in middle-aged adults and young children-an analysis of OPTN data. Transplantation 2013 Jan;95(2):319-325. 6. Elli M, Valeri M, Pisani F, Tisone G, Utzeri G, De Paolis P, et al. Developing countries as the major future source of living donor renal transplants. Transplant Proc 1992 Oct;24(5):2110-2111. 7. Babik JM, Chin-Hong P. Transplant tourism: understanding the risks. Curr Infect Dis Rep 2015 Apr;17(4):473. 8. Cohen DJ. Transplant tourism: a growing phenomenon. Nat Clin Pract Nephrol 2009 Mar;5(3):128-129. 9. Champan JR. The consequences of Successful transplantation. Lancet 2011 Oct;378(9800):1357-1359. 10. Jafar TH. Organ trafficking: global solutions for a global problem. Am J Kidney Dis 2009 Dec;54(6):1145-1157. 11. World Health Assembly. Fifty-seventh World Health Assembly WHA57.18: human organ and tissue transplantation. WHO [cited 2017 December]. Available from: http://apps.who.int/gb/ebwha/pdf_files/WHA57/A57_R18-en.pdf. 12. Steering Committee of the Istanbul Summit. Organ trafficking and transplant tourism and commercialism: the Declaration of Istanbul. Lancet 2008 Jul;372(9632):5-6. 13. World Health Organization. Regional consultation on cell, tissue and organ transplantation. Karatchi, Pakistan; 2005. p. 26-28. 14. Samir N, Karim S. An insight: medical tourism, local and international perspective. Oman Med J 2011 Jul;26(4):215-218. 15. Schwartz GJ, Furth SL. Glomerular filtration rate measurement and estimation in chronic kidney disease. Pediatr Nephrol 2007 Nov;22(11):1839-1848. 16. National high blood pressure education program working group on high blood pressure in children and adolescents. The fourth report on the diagnosis, evaluation and treatment of high blood pressure in children and adolescents. Pediatrics 2004;114(S2):555-576. 17. Racusen LC, Solez K, Colvin RB, Bonsib SM, Castro MC, Cavallo T, et al. The Banff 97 working classification of renal allograft pathology. Kidney Int 1999 Feb;55(2):713-723. 18. Smith JM, Martz K, Blydt-Hansen TD. Pediatric kidney transplant practice patterns and outcome benchmarks, 1987-2010: a report of North American Pediatric Renal Trial and Collaborative Studies. Pediatric Transplant 2013 Mar;17(2):149-157. 19. Issa H. Reham Al Mardini, Ghazi S. Pediatric Renal Transplant: Jordan’s experience. Saudi J Kidney Dis Transpl 2013;24(1):157-161. 20. Naderi G, Latif A, Karimi S, Tabassomi F, Esfahani ST. The long-term outcome of pediatric kidney transplantaion in Iran: Result of a 25-years single-center cohrt study. Int J Organ Transplant Med 2017;8(2):85-96. 21. Al-Eisa A, Naseef M, Al-Hamad N, Pinto R, Al-Shimeri N, Tahmaz M. Chronic renal failure in Kuwaiti children: an eight-year experience. Pediatr Nephrol 2005 Dec;20(12):1781-1785. 22. Lidwien A. Tjadan, Marles Noordzij. Racial disparities in access to and outcome of kidney transplantation in children, adolescents, and young adult: result from ESPN/ERA-EDTA Registry. Am J Kidney Dis 2016;67:293-301. 23. Yamada A, Tashiro A, Hiraiwa T, Kormatsu T, Kinukawa T, Ueda N. Long-term outcome of pediatric renal transplantation: a single center study in Japan. Pediatric Transplant 2014;18(5):453-462. 24. Kasiske BL, Anjum S, Shah R, Skogen J, Kandaswamy C, Danielson B, et al. Hypertension after kidney transplantation. Am J Kidney Dis 2004 Jun;43(6):1071-1081. 25. Maj A. Al Khalidi, Ahmed BQ, Opelz G, Schaefer F. Outcome of kidney transplant tourism in children: a single center experience. Pediatr Nephrol 2010;25:155-159. 26. Alghamdi SA, Nabi ZG, Alkhafaji DM, Askandrani SA, Abdelsalam MS, Shukri MM, et al. Transplant tourism outcome: a single center experience. Transplantation 2010 Jul;90(2):184-188. 27. Cha RH, Kim YC, Oh YJ, Lee JH, Seong EY, Kim DK, et al. Long-term outcomes of kidney allografts obtained by transplant tourism: observations from a single center in Korea. Nephrology (Carlton) 2011 Sep;16(7):672-679. 28. Gill J, Madhira BR, Gjertson D, Lipshutz G, Cecka JM, Pham PT, et al. Transplant tourism in the United States: a single-center experience. Clin J Am Soc Nephrol 2008 Nov;3(6):1820-1828. 29. Prasad GV, Shukla A, Huang M, D’A Honey RJ, Zaltzman JS. Outcomes of commercial renal transplantation: a Canadian experience. Transplantation 2006 Nov;82(9):1130-1135. 30. Canales MT, Kasiske BL, Rosenberg ME. Transplant tourism: Outcomes of United States residents who undergo kidney transplantation overseas. Transplantation 2006 Dec;82(12):1658-1661. 31. Kennedy SE, Shen Y, Charlesworth JA, Mackie JD, Mahony JD, Kelly JJ, et al. Outcome of overseas commercial kidney transplantation: an Australian perspective. Med J Aust 2005 Mar;182(5):224-227. 32. Sever MS, Kazancioğlu R, Yildiz A, Türkmen A, Ecder T, Kayacan SM, et al. Outcome of living unrelated (commercial) renal transplantation. Kidney Int 2001 Oct;60(4):1477-1483. 33. Ben Hamida F, Ben Abdallah T, Goucha R, Hedri H, Helal I, Karoui C, et al. Outcome of living unrelated (commercial) renal transplantation: report of 20 cases. Transplant Proc 2001 Aug;33(5):2660-2661. 34. Mansy H, Khalil A, Aly TF, Filobbos P, al-Dusari S, al-Shareef Z, et al. Outcome of commercial renal transplantation: two years follow-up. Nephron 1996;74(3):613-616.